STITCHES DOLL PROJECT TRAVELS AROUND THE COUNTRY NEW MEXICO, MICHIGAN, PENNSYLVANIA, FLORIDA FOR BLEEDING DISORDER CONFERENCES For 3 days in March, STITCHES staff members promoted the new outreach program for girls and women who bleed at the HFA Annual Symposium in Albuquerque, New Mexico. The ClotNot Club, the program is called, was greeted with enthusiasm by both consumers and industry representatives. During the conference STITCHES staff hosted a doll making suite, equipped with a wide range of materials, embellishments, paints, and a professional doll maker trained in art therapy and counseling. STITCHES also had an information/exhibit table with a doll display and brochures available in both English and Spanish. Our attendance was made possible by a sponsorship from Critical Care Systems. 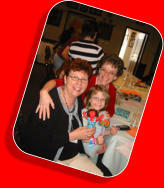 In April a ClotNot Club doll making session took place at the Hemophilia Foundation of Michigan’s Springfest event. We have been invited to Pennsylvania’s camp in August to work with young people there and the dolls will also be featured at NHF’s Annual Meeting in Orlando this November!! These are exciting times for the doll project. We are getting the information out into the community so that people are aware of this free, innovative, and inspiring outreach program. Girls and women have the opportunity to create small red dolls and decorate them any way they want.Then they answer the question, “If your doll could talk what would she say?” When completed the dolls become part of a traveling exhibit that educates everyone about the issues surrounding bleeding disorders. They are also posted on our website as a virtual exhibit for the whole world to see. Since filing for our non-profit status in December, we have had many requests for workshops and doll exhibits from all around the country. To date, we have not been successful in securing specific grant funding. This is where we are looking for your help. We are seeking sponsors for these programs. Until we are able to get grant funding to cover expenses, we still want to provide these programs to our consumers. If you, or an organization you are affiliated with, are interested in being one of our sponsors, please contact Kathleen Gerus-Darbison toll-free at 1-866-554- 2368. The doll project is an interesting and cost-effective way to accomplish a number of things; increase the awareness of bleeding disorders in women and girls, to give these women a voice to share their lessons learned, and to educate the greater community – both lay and medical. 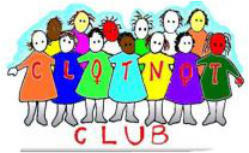 ClotNot Club doll exhibits will be part of outreach done at agencies, community events, health fairs, conferences, hospitals, schools, and universities around the country. This is a great way to reach lots of families and individuals!